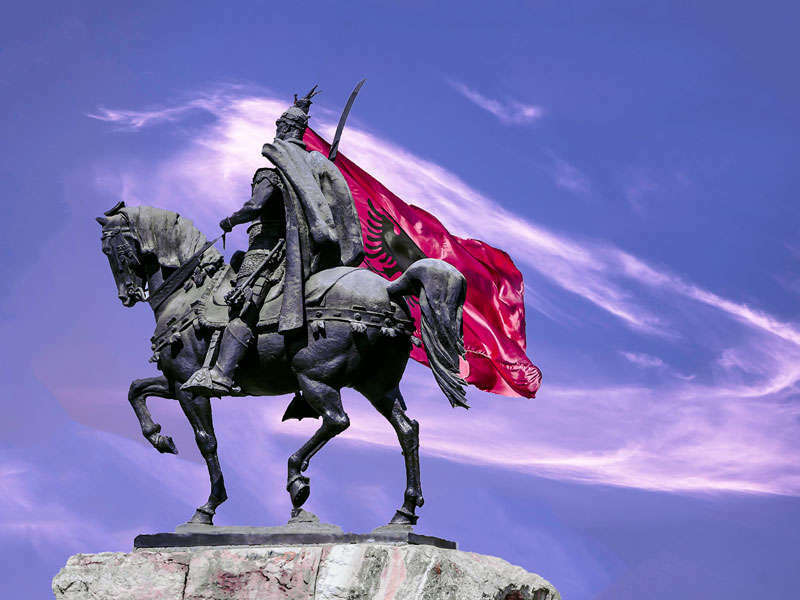 Skanderbeg Monument in Skanderbeg Square has been regarded for more than half a century as the very centre of Tirana. It commemorates the 15th century nobleman, and hero of the nation for resisting the Ottomans. He is our King Arthur, our William Tell. The sculpture, created by Odhise Paskali, is 11 metres (36 ft) tall, and was inaugurated in 1968 on the 500th anniversary of the death of Skanderbeg. 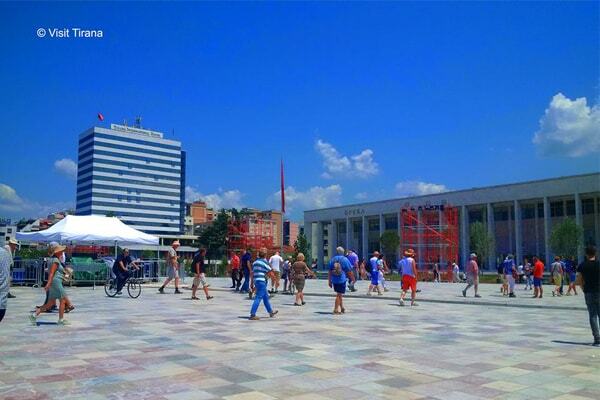 The square that bears his name is a meeting place for all Albanians. It is the place where many of the most important cultural sites of Tirana and Albania are located—the National Museum, the Clock Tower, Et’hem Bey Mosque, Palace of Culture, National Library, Theatre of Opera and Ballet, and Bank of Albania—while at his back are lined up most of the government buildings. 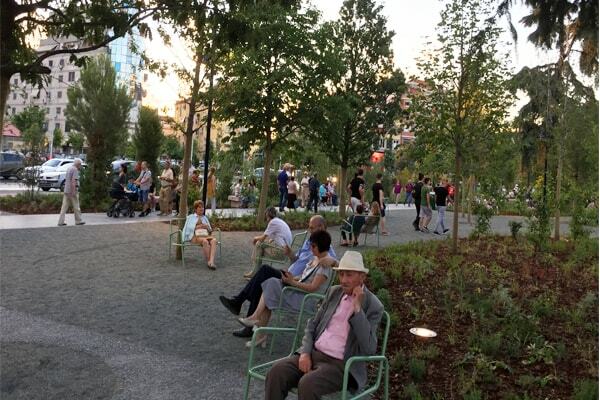 Scanderbeg square had a huge restoration and it reopened on 10th of June, 2017. A giant pedestrian area and according to Mayor Veliaj, the biggest in Balkans. 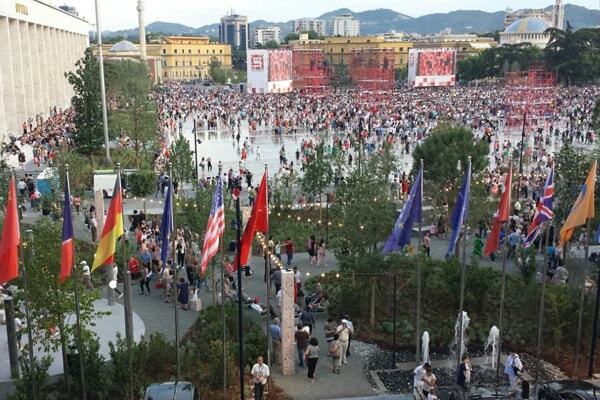 The elements of the new square are: almost 28 000 square meters paved with tiles from all the places where Albanians live. This stoned pavement has a form of shallow pyramid with the highest point in the middle at about 1.80 m. The square has more than 100 fountains with fresh water, to keep the place cool during the hot summer. The Scanderbeg Square, The National Opera, National Museum and National Bank surround the stone pavement, while behind these buildings, there are planted trees from all over Albanian territory. Mini- parks, benches, flowers, platforms for taking photos or altar for getting married, are part of the square. There are 32 square meters planted with different aromatic trees and 90 000 square meters walking area, while the underground parking can allow about up to 300.